(CNS): Full story — Three men were found not guilty Monday for the murder of Alrick Peddie, also known as 'Bling', in West Bay last year. Deward Bush and Jose Sanchez walked out of the courtroom, immediately free men, after Justice Harrison said the crown had failed to prove its case against the men in the trial which began last month. Aaron Crawford remained in custody in order to clear up other matters. The court room erupted with emotional scenes when the judge handed down the not guilty verdict, stating he did not find the crown's key witness Michael Ebanks credible. 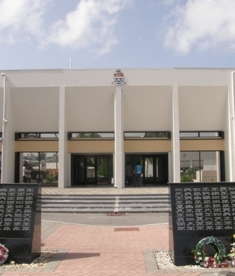 Peddie's widow, who was present for the verdict, was taken to George Town hospital after she collapsed outside the courthouse. Peddie was gunned down in Michael Ebanks' family yard on Willie Farington Drive on the 24 March. Ebanks had been the crown's key witness against Bush, Sanchez and Crawford, who were charged with the murder as a joint enterprise. In his ruling, the judge said the case had hung on the credibility of Ebanks' eyewitness account as the prosecution had very little forensic and circumstantial evidence. “Identity is the crucial issue in the trial, “ said Justice Harrison. In his evidence, Ebanks said that he saw Bush, Sanchez and Crawford pull into the yard at a high speed in a red Honda Civic, which belonged to a friend of his. However, conflicting testimony from an earlier witness in the case presented by the defense suggested that Ebanks had previously stated that the men were masked. The crown's case depended on the judge believing that Ebanks was telling the truth when he said he saw the three men very clearly. On the other hand, the defense had used the statement of this early witness, which indicated that on the evening of the murder Ebanks had said the gunmen were masked. The defense had also pointed to the evidence that all windows on the Honda Civic were heavily tinted. The judge pointed out that he was faced with two irreconcilable positions in relation to the case. He revealed to the court his concerns over Ebanks' story. “A doubt lingers in my mind over Ebanks' ability to have made the identification,” he said. “ I reject his explanations … I am convinced this witness was making up the story as he went along to try and justify what he said he saw." The judge explained that he could not be sure about his evidence which was compounded by the lies he told about his brother not being at the scene of the crime. The judge was not convinced by the crown's other evidence, such as the DNA and the gunshot residue, and he also said that the telecommunications evidence contributed nothing to the case. In his verdict, Justice Harrison said that in the absence of any supporting evidence and the fact that identification was made in difficult circumstances he could not be sure that the three men before him had committed the murder as a joint enterprise. “The crown has not discharged the burden to satisfy me so that I feel sure that these defendants were there and killed Alrick Peddie,” he said as he handed down the not guilty verdict. Friends and family of the defendants cheered as Bush and Sanchez were immediately released from custody. It is understood that Crawford is dealing with other issues and was remanded back in custody. Meanwhile, Alrick Peddie's widow who had fled from the courtroom as the judge read the verdict collapsed on the pavement outside the George Town library nearby the courthouse. She was assisted by friends, family and emergency services before being taken to the George Town Hospital. u can gt away with murder in cayman now even boldface and even if someone sees you? so they walk free and the few that tried to help have to run for their lives? even with a eye witness!